For other uses, see Darkman (disambiguation). Darkman is a 1990 American superhero action film directed and co-written by Sam Raimi. It is based on a short story Raimi wrote that paid homage to Universal's horror films of the 1930s. The film stars Liam Neeson as Peyton Westlake, a scientist who is attacked and left for dead by a ruthless mobster, Robert Durant (Larry Drake), after his girlfriend, an attorney (Frances McDormand), runs afoul of a corrupt developer (Colin Friels). Unable to secure the rights to either The Shadow or Batman, Raimi decided to create his own superhero and struck a deal with Universal Studios to make his first Hollywood studio film. The design and creation of the makeup effects required to turn Liam Neeson into Darkman were the handiwork of makeup effects artist Tony Gardner, who also cameos in the film as the Lizard Man in the carnival Freak Show sequence. Darkman was generally well received by critics and performed well at the box office, grossing almost $49 million worldwide, well above its $16 million budget. This financial success spawned two direct-to-video sequels, Darkman II: The Return of Durant (1995) and Darkman III: Die Darkman Die (1996), as well as comic books, video games, and action figures. Over the years, Darkman has become regarded as a cult film. Scientist Dr. Peyton Westlake is developing a new type of synthetic skin to help acid-burn victims. He is frustrated with a flaw that causes the skin to rapidly disintegrate after 99 minutes. His girlfriend, attorney Julie Hastings, discovers the Bellasarious Memorandum, an incriminating document proving that corrupt developer Louis Strack has been bribing members of the zoning commission. Before she leaves, Westlake asks her to marry him, but she hesitates. When she confronts Strack, he confesses, but shows Julie what he's been planning: To design a brand new city which would create a substantial number of new jobs. He also warns Julie to keep her guard up as mobster Robert Durant wants the document. Back at Westlake's lab, Dr. Westlake is conducting an experiment when the lights go out. Dr. Westlake and his assistant, Yakatito are astounded to find the synthetic skin is stable after 100 minutes. Westlake deduces that the synthetic skin is photosensitive. Their joy is short lived, as Durant and his henchmen show up and demand the Bellasarious Memorandum which Westlake knows nothing about. While searching for the document, Durant and his gang kill Yakatito. The gang then proceed to beat Westlake, burn his hands on a piece of machinery and dip his face in acid, disfiguring him. After they find the document, they rig the lab to explode, with Julie watching the explosion. The blast throws Westlake through the roof and into the river. Thought to be dead by Julie, who attends his funeral, he survives but is hideously burned. He is brought to a hospital and subjected to a radical treatment which cuts the nerves of the spinothalamic tract, so physical pain is no longer felt. However, he also loses his tactile sensation. Removing this sensory input gives him enhanced strength due to adrenal overload and keeps his injuries from incapacitating him, but it also mentally destabilizes him. After mourning the loss of his lab and realizing how badly burnt he has become, Westlake re-establishes the lab in a condemned building, using digitization to create a mask of his original face. The process is long, and in the meantime, Westlake plots revenge against Durant and his men. He kills Durant's favorite henchman Rick, but not before forcing the latter to reveal the identities of those involved, along with their criminal activities. Westlake then studies his enemies in order to subdue and impersonate them. When his face mask is complete, Westlake manages to convince Julie that he is indeed alive, and that he was in a coma rather than dead. He is aware of Julie seeing Strack after his supposed death, and eventually confronts her, to which she responds that Strack only comforted her. Westlake does not tell Julie about his condition, but asks her various questions on whether or not she would accept him, regardless of his appearance. Westlake now has a full clock schedule: Making the skin last longer than 99 minutes, visiting Julie, studying his enemies and even mimicking their voice patterns. His next excursion has him impersonating Durant himself, causing confusion among the mobster and his henchmen. The next time Westlake and Julie have a date at the carnival, an altercation causes Westlake to lose his temper and inadvertently reveals to Julie that there is indeed something wrong with him. She follows him as he flees (his 99 minutes were up,) and when she discovers that he was using masks to hide his true face, she calls out to Peyton that she still loves him regardless. Julie later tells Strack that she can no longer see him, and after discovering the Bellasarious Memorandum on his desk while he was on the phone, she confirms that Strack was collaborating with Durant the entire time. She tells him that Westlake is still alive, but Strack tells her that as long as he has the memorandum, no charges can be filed. When Julie leaves, Durant enters and is told by Strack to capture Julie and kill Westlake. Westlake eventually succeeds in killing Durant and all of his henchmen (except for the one with the wooden gun leg whose fate is unknown). Westlake impersonates Durant one final time when he meets up with Strack and a captive Julie as Strack plans to make the city "one less attorney." Westlake's ruse is broken by Strack who fights him on an unfinished building floor 650 feet from the ground upon Strack unmasking him. When Westlake gets the upper hand, Strack calls his bluff by saying that killing him would not be something he could live with. Westlake then drops Strack to his death saying to himself: "I'm learning to live with a lot of things." Julie tries to convince Westlake that he can still return to his old life, but Westlake tells her he has changed on the inside as well as out, and can not subject anyone to his new vicious nature. In the final scene, he runs away from Julie as they exit an elevator, and is seen from behind pulling on a mask which, when he turns around, reveals the face of Bruce Campbell. During this scene, Westlake can be heard off-screen: "I am everyone and no one. Everywhere. Nowhere. Call me... Darkman." Liam Neeson as Peyton Westlake / Darkman, a brilliant scientist who was left for dead and burned alive as he returns to seek revenge on those who made him what he is. Originally, Raimi's longtime friend and collaborator Bruce Campbell was set to play Darkman, but the studio balked at the idea because they did not think Campbell could carry the role. Gary Oldman and Bill Paxton were also considered before Liam Neeson was cast. For the role, Raimi was looking for someone who could suggest "a monster with the soul of a man, and I needed an actor who could do that beneath a lot of makeup" and liked Neeson's "old Gary Cooper charisma." The actor was drawn to the operatic nature of the story and the inner turmoil of his character. To research for the role, Neeson contacted the Phoenix Society, an organization that helps accident victims with severe disfigurements adjust to re-entering society. Frances McDormand as Julie Hastings, a district attorney and Peyton's love interest. Raimi had wanted to work with Frances McDormand but the studio resisted this notion and almost cast Julia Roberts before Pretty Woman made her a star. At one point, they wanted Demi Moore for the role. The director even tested Bridget Fonda but felt that she was too young for Neeson. Colin Friels as Louis Strack Jr., the corrupt and ruthless billionaire developer who runs Strack Industries. He bribes members of the city zoning commission to further his ambitious construction project (which he dubs the "City of the Future"), and employs Durant and his gang to eliminate anyone who gets in his way, even his own wife. He and Darkman have their final battle atop one of Strack's half-finished skyscrapers at the film's climax. Larry Drake as Robert G. Durant, a ruthless, sadistic mob boss and the head of his own criminal organization. He auditioned for the film and Raimi liked the way he underplayed the character, "quiet and careful, yet intense," the actor remembers. The director had never seen L.A. Law but found that Drake's face reminded him of "a modern day Edward G. Robinson. He looked so mean, so domineering, yet he had this urban wit about him. I thought, 'My God, this guy is not only threatening-looking, he has a good physical presence – what a perfect adversary for the Darkman!'" In addition, Bruce Campbell has a cameo in the film as Peyton's last seen disguise (credited as "Final Shemp"). Sam Raimi himself cameos as a hospital intern. For a long time, Sam Raimi had been interested in adapting a comic book into a film. He had pursued and failed to secure the rights to both The Shadow and Batman and decided to create his own. The initial idea Raimi had for Darkman was of a man who could change his face. He has said that he drew inspiration from those films as well as The Phantom of the Opera and The Elephant Man. Raimi was also inspired by the Universal horror films of the 1930s and 1940s because "they made me fear the hideous nature of the hero and at the same time drew me to him. I went back to that idea of the man who is noble and turns into a monster". He originally wrote a 30-page short story, titled "The Darkman", and then developed into a 40-page treatment. At this point, according to Raimi, "it became the story of a man who had lost his face and had to take on other faces, a man who battled criminals using this power". It also became more of a tragic love story in the tradition of The Hunchback of Notre Dame. In 1987, Raimi submitted the treatment to Universal Pictures which they liked, green-lighted a budget in the range of $8–12 million, and suggested that he get a screenwriter to flesh out the story. The more Raimi worked, the more Darkman became a crime-fighting figure, "a non-superpowered man who, here, is a hideous thing who fights crime. As he became that hideous thing, it became more like The Phantom of the Opera, the creature who wants the girl but who was too much of a beast to have her," Raimi said. The process of developing his treatment into a screenplay was difficult with Raimi hiring ex-Navy SEAL Chuck Pfarrer based on his work on Navy SEALs. He wrote the first draft and then Raimi's brother, Ivan (a doctor), wrote drafts two through four with Sam. Ivan made sure that the medical aspects and scientific elements were authentic as possible given the nature of the story. As Raimi and his producing partner Robert Tapert progressed through various drafts, they realized that there was a potential franchise on their hands. Universal brought in screenwriting brothers Daniel and Joshua Goldin to work on the script. According to Daniel, they were presented with various drafts and "lots of little story documents. There was just material everywhere; drafts seemed to go in many directions." Goldin said that they "spent a lot of time talking and pulling together a way of making the story work. I think that mostly we talked in terms of the nuts and bolts of the story." The Goldins added new lines of dialogue, new characters and bits of action. The studio still wasn't satisfied so the Raimi brothers wrote drafts six through twelve before they had a shooting script. For Raimi, he wanted to emphasize Peyton/Darkman's arc over the course of the film. He said, "I decided to explore a man's soul. In the beginning, a sympathetic, sincere man. In the middle, a vengeful man committing heinous acts against his enemies. And in the end, a man full of self-hatred for what he's become, who must drift off into the night, into a world apart from everyone he knows and all the things he loves." Working with Universal meant a significant increase in budget for Raimi. This allowed him to design and build a laboratory set for Darkman and afford helicopters and professional stuntmen to film the climactic helicopter chase through the city. He was eventually given $16 million to work with, including a longer schedule and much more effects work. Look-wise, the filmmaker was interested in paying homage to Universal horror films of the 1930s. Production designer Randy Ser remarked, "if you look at Darkman's lab that he moves into, which is an old warehouse, what was on my mind was Dr. Frankenstein. There were a number of references visually to what we were thinking about in regards to those films." Raimi consciously wanted to tone down his style because of a desire to "get into the characters' heads and follow them as real human beings in extraordinary circumstances". McDormand and Neeson worked closely in rehearsals, rewriting the three love scenes they had together after he becomes Darkman. They got through these scenes, according to the actress, by depending on "each other's knowledge, of theater and each other." Raimi said directing McDormand was "very difficult". Raimi said, "apparently I didn't know Fran as well as I thought I did ... The reason it was difficult was that our conception of the best movie to make differed, arguing in trying to make the best picture possible. We did come across disagreements, but they were very healthy." Durant's finger collection developed over the Pfarrer and Raimi brothers drafts. The director wanted a specific trademark for the character – one that hinted at a military background. Neeson worked in ten-piece prosthetic makeup, sometimes for 18 hours. He saw the lengthy time spent in extensive makeup as a challenge and liked "the idea of working behind a mask on camera, and just exploring the possibilities of what that entailed." He and makeup effects designer Tony Gardner did tests using specific glues, foams, and bandage coverings. They also timed how fast they could apply the prosthetic makeup and put the costume on. Neeson worked with the costume designer on his outfit, including aspects like the cloak. The hardest part for the actor was speaking with false teeth and he ended up doing "a lot of work on my voice – I didn't want the [false teeth] to move at all." Raimi and Tapert ran into conflicts with the studio during post-production. The director had a problem with the editor that the studio assigned him and eight weeks into assembling the rough cut, he was not following Raimi's storyboards. The editor had a nervous breakdown and left. Early preview screenings did not go well as people laughed in the wrong places and complained about a lack of a happy ending. Universal told Raimi that some people rated Darkman the worst film they had ever seen. According to executives, the film was one of the worst-scoring pictures in Universal's history. Then, two preview screenings, one with Danny Elfman's score, went well. Tapert remembers, "the experience on Darkman was very difficult for Sam and me; it isn't the picture we thought it should be, based on the footage we shot and all that. The studio got nervous about some kind of wild things in it, and made us take them out, which was unfortunate." However, Raimi did like the "brilliant" marketing campaign that the studio came up with, releasing posters in advance with a silhouette of the main character and the question, "Who is Darkman?" According to the director, "the marketing made the film a money-maker." 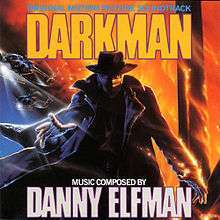 Released on August 17, 1990, the soundtrack to Darkman was composed by Danny Elfman, who previously scored the music to Tim Burton's Batman in 1989. Elfman said of his score, "Again old-fashioned and melodramatic, but in a way that I'm crazy about. Sam Raimi has a wonderful visual style that lends itself easily to music. It was an enormous relief writing long, extended musical sequences, something which is very rare in modern films. No reason to hold back on this one." Ads asking "Who is Darkman?" began appearing on bus benches, public transit, and television as early as June 1990. Universal VP of Media Vic Fondrk said that the studio did not want to spend much money promoting the film in advance, "but we wanted to create some intrigue for the Darkman character." On its opening weekend, Darkman grossed a total of $8 million in 1,786 theaters. To date, the film has grossed a total of $48.8 million worldwide. The film enjoyed generally favorable reviews and holds an aggregate of 82% on Rotten Tomatoes, out of the 55 reviews 45 were positive. Los Angeles Times film critic Michael Wilmington felt that Darkman was the only film at the time "that successfully captures the graphic look, rhythm and style of the superhero books." Terrence Rafferty of The New Yorker said, "Raimi works from inside the cheerfully violent adolescent-male sensibility of superhero comics, as if there were no higher style for a filmmaker to aspire to, and the absence of condescension is refreshing." USA Today gave the film three out of four stars. However, Richard Corliss in Time said that Raimi was not "effective with actors" and People's Ralph Novak called Darkman, a "loud, sadistic, stupidly written, wretchedly acted film." Entertainment Weekly gave the film a "B" rating and Owen Gleiberman wrote, "The movie is full of jaunty, Grand Guignol touches (the main gangster enjoys snapping and collecting fingers), but Raimi's images also have a spectral, kinetic beauty." In his review for the Washington Post, Joe Brown wrote, "Though Raimi seems to be trying to restrain himself, his giddily sick sense of humor still pops out all over the place – Darkman is a frenetic funhouse ride that has you laughing and screaming at the same time." 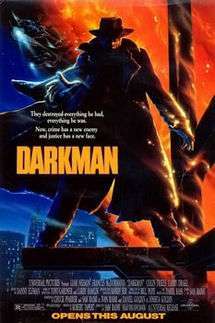 Darkman was singled out for notice by comic-book writer Peter David in the Comics Buyer's Guide as "The Perfect Super-Hero Film of All Time," although this assessment was based upon other features of the film than general quality. Darkman is now regarded by some as a cult film. Universal Television financed a 30-minute television pilot based on Darkman, which was made in 1992 and was to be shown on Fox. The pilot retold the origin of the character (with some alterations) and introduced several new characters. Christopher Bowen starred in the role of Peyton Westlake/Darkman, Larry Drake reprised his role of Robert G. Durant, and Kathleen York played the cop, Jenny. The origin is similar to the one in the original film as Peyton discovers his synthetic skin, is attacked and left for dead by Durant and his gang. In this version, however, Peyton is already married to Julie, and she is killed in the explosion. As in the films, Westlake becomes the Darkman, and seeks vengeance on Durant and his gang. Darkman's headquarters are based in an abandoned observatory overlooking the city, and he is wanted by the police for his actions against Durant's gang. The pilot ends with some scenes from the first film (particularly of Darkman and Durant fighting) and Darkman stating that Justice will answer with a brand new face. In 1998, Darkman was released on DVD. Bonus material included production notes, cast & crew bios, and a trailer. In 1999, The Return of Durant was released on DVD. Bonus material included production notes, cast & crew bios, a trailer, and web links. In 2004, Die, Darkman, Die was released on DVD as part of the "Universal Studio Selections". The DVD contained no bonus material or even a main menu (although there still were chapter selections). On August 7, 2007, all three Darkman films were released in a box set by Universal Studios Home Entertainment. Each is presented in 1.85:1 anamorphic widescreen, along with an English Dolby Digital 5.1 Surround track. No extra material was included. The high definition version of Darkman was released on HD DVD July 31, 2007. A Blu-ray Disc edition of the first film was released on June 16, 2010. Shout! Factory released a second Blu-ray edition on February 18, 2014. In 2005, SOTA produced two versions of their Darkman action figure (including interchangeable head and hands to allow the figure to be either bandaged or revealing his scarred visage), as well as a Darkman statue. Dynamite Entertainment announced in 2006 that it had reached an agreement with Universal Studios Consumer Products Group to produce original comics based on Darkman. A bimonthly limited series entitled Darkman vs. Army of Darkness was published from August 2006 to March 2007. In November 2007, Sideshow Collectibles put up for pre-order a 1:4 scale "Premium" Format Figure version of Darkman that would be released 3rd Quarter 2008. With release in 1990, Marvel Comics published a 3-issue adaptation of Darkman in color along with a larger black and white magazine size adaptation consisting of all three issues. In 1993, Darkman returned in a 6 issue mini-series also published by Marvel Comics. In 2006, Dynamite Entertainment published a cross over that pitted Darkman against Sam Raimi’s Ash Williams of the Evil Dead/Army of Darkness franchise. Along with release in 1990, Jove Books published the novel adaptation written by Randall Boyll. In 1994, Boyll returned to expanding upon the adventures of Darkman in a four novel miniseries from Pocket Books. Over Pocket Books’ four novels (The Hangman, The Price of Fear, The Gods of Hell, and In the Face of Death) Boyll further develops Darkman’s character and how he deals with his new existence as an outcast individual with the ability to help others. ↑ "DARKMAN (15)". British Board of Film Classification. 1990-11-07. Retrieved 2012-12-14. 1 2 "Darkman". Box Office Mojo. May 23, 2007. Retrieved 2007-05-23. 1 2 Tobias, Scott (July 2, 2009). "Darkman". The Onion A.V. Club. Retrieved 2009-07-07. 1 2 3 4 5 6 7 8 9 10 11 Muir, John Kenneth (May 2004). "The Unseen Force: The Films of Sam Raimi". Applause Books. 1 2 3 4 5 6 7 Counts, Kyle (December 1990). "Heart of Darkness". Starlog. 1 2 3 Counts, Kyle (January 1991). "Black Heart". Starlog. 1 2 3 4 5 Warren, Bill (January 15, 2001). "The Evil Dead Companion". St. Martin's Griffin. 1 2 Johnston, Sheila (November 9, 1990). "Beauty Within the Beast". The Independent. 1 2 3 4 Warren, Bill (September 1990). "The Man Behind Darkman". Fangoria. ↑ Italie, Hillel (September 12, 1990). "Beauties, Beasts and 'Biff!' 'Bam!' 'Pow!'". Associated Press. 1 2 3 Stanley, John (August 26, 1990). "Darkman Brings Director's Talent to Light". San Francisco Chronicle. ↑ Portman, Jamie (August 16, 1990). "Horror can be a labor of love". Toronto Star. 1 2 3 McDonagh, Maitland (1995). "Filmmaking on the Fringe". ↑ Arnold, Gary (August 23, 1990). "Sam Raimi's Flair Makes Darkman A Reel Delight". Washington Times. ↑ "Darkman". Danny Elfman's Music for A Darkened People. Retrieved 2007-08-07. ↑ Magiera, Marcy (August 20, 1990). "Studio to tease Misery". Advertising Age. ↑ Clark, Mike (August 24, 1990). "Darkman conjures up a thriller". USA Today. ↑ Gleiberman, Owen (August 24, 1990). "Darkman". Entertainment Weekly. Retrieved 2009-07-07. ↑ Brown, Joe (August 24, 1990). "Darkman". Washington Post. Retrieved 2009-07-07. ↑ David, Peter (October 5, 1990). "The Perfect Super-Hero Film of All Time". Comics Buyer's Guide. Retrieved 2007-11-08. ↑ Donlon, Brian (March 26, 1992). "Networks brim with series possibilities". USA Today. ↑ Woodward, Tom (May 22, 2007). "The Darkman Trilogy". DVDActive. Retrieved 2007-05-23. ↑ Butane, Johnny (January 22, 2005). "Macaluso, Jerry (SOTA Toys)". Dread Central.com. Retrieved 2007-12-11.